Editor’s Note: This is the first article in a two-part Prospect Journal series on the unrest in Mexico. The second part can be found here. “I’m tired,” uttered a grim-faced Jesús Murillo Karam—Mexico’s Attorney General—in an attempt to cut off any further questions at his hour-long press conference regarding the 43 students missing since September 26 from just outside Iguala, a small city located 80 miles (125km) south of Mexico City. Perhaps realizing his poor choice of words, the attorney general agreed to take one more question and then proceeded to walk off stage. His words would quickly become the latest rallying cry of the increasingly violent social unrest currently stirring in Mexico. Murillo had just informed the nation and international observers that three detained members of an organized crime ring known as Guerreros Unidos (United Warriors) had confessed to the kidnapping and brutal execution of around forty individuals near Iguala on the night of September 26, the same day and location the students were last seen. In gruesome detail, he added that detainees calcined the bodies of their victims, crushed their bones beyond recognition, and dumped their remains—using black plastic bags—in a local river. The attorney general showed videos of the detainees, and the locations where federal investigators found human remains that allegedly match the acts described in the confessions. Murillo took efforts to avoid presenting the findings as conclusive, and vowed not to close the case until the human remains could be confirmed by foreign forensic experts to be the missing students. As of this week, federal investigators have unearthed 11 mass graves in the area surrounding the municipality of Iguala. They collectively contain up to 38 bodies confirmed not to belong to any of the 43 missing students. Due to widespread distrust of the government and a lack of appropriate technology, the charred remains discussed in Murillo’s conference will be sent to Innsbruck’s Medical University in Austria for DNA analysis and identification. The Ayotzinapa Case—and its handling—has yet again demonstrated the endemic violence and systemic corruption that has plagued Mexico for decades. The crisis has exposed the flaws underlying the current administration’s optimistic narrative and challenged its legitimacy; it has shed light on the structural incapacity of local, state and federal institutions to address the corruption that rots their core; it has focused attention on the nation’s most open of secrets: the widespread infiltration of criminal organizations within police and government forces, and the collusion between organized crime and elected officials. Above all, Ayotzinapa has become the latest epicenter of institutional and political decay. Seldom does violence, morbid on its own, manifest itself in such a macabre spectacle and involve such intricate a web of participants. Founded in 1926, the all-male Raúl Isidro Burgos Normal Rural College of Ayotzinapa is one of nine normal schools in Guerrero, one of the poorest and most dangerous states in Mexico. It was established to train students to be elementary school teachers and gives priority admission to those who cannot afford higher education. Chronically underfunded and characterized by its left-wing tendencies, the school has a long history of social activism, civil disobedience, and friction with authority. It’s small, mountaintop campus features murals of socialist leaders and revolutionary quotes, and provides tuition-less training for those that call it home. “Normalistas,” as the school’s students are called, come from the most underdeveloped areas in the country to seek better opportunities. Given their economic and social hardship, students at the school seldom have access to opportunities other than rural fieldwork or manual labor. Many attend the normal school to pursue better job prospects in education, make a difference in their impoverished communities, or join the social movements for which the school is known. Students also often engage in illegal practices in the name of social struggle. Although they enjoy acquiescence from local residents, their tactics often put them at odds with local law enforcement and frequently alienate the local press. The student-teachers often hijack commuter and commercial transportation vehicles to use as their own transport by blockading roads and paying off drivers for their trouble. They also frequently loot commercial vehicles owned by large corporations to protest their disproportionate wealth and influence in government. In 2011, two students died when state police dispersed a normalista blockade of a major highway after students set fire to a gas station. Police initially claimed they were returning fire, but retracted their story after a video proved the students were unarmed. Every October, normalistas head to Mexico City to commemorate the Tlatelolco Massacre of 1968. Seeking to raise funds and secure transport for their visit to the capital, dozens of normalistas headed to the small city of Iguala in the late hours of September 26. That same night, Iguala Mayor José Luis Abarca and his politically ambitious wife, María de los Ángeles Pineda, were hosting an event to celebrate Ángeles Pineda’s “accomplishments” as head of the Iguala branch of the National System for Integral Family Development (DIF). The event also served the couple’s political fortunes by positioning Ángeles Pineda as the presumptive successor to Mayor Abarca, ensuring the couple’s influence for years to come. Both officials had previous experiences with the normalistas. Students had previously protested outside Iguala’s city hall when news broke that local activists had been tortured and killed. Upon encountering the Iguala-bound buses, municipal police—aided by members of Guerreros Unidos—opened fire. Some of the buses tried to drive away, but police vehicles quickly caught up with them. Others tried abandoning the buses and fled the chaos by foot. Some managed to survive. The clash left 6 people dead—three of them students. Police managed to capture and detain at least 43 normalistas; all of which remain missing to this day. Facing increased scrutiny over the events of that transpired on the 26, Mayor Abarca requested a leave of absence on September 29. He, alongside his wife and Iguala’s secretary of public safety, immediately went missing and ceased communication with government authorities. As details of their links to organized crime and their role in the events of September 26 became clear, the couple quickly became Mexico’s most wanted duo and the focal point of one of the biggest criminal and political manhunts in recent Mexican memory. Facing growing public outrage over his alleged links to the couple, criticism over the slow response of his administration, and claims that he was aware of when and how the students died, Guerrero Governor Ángel Aguirre has recently resigned. Dubbed the ‘Imperial Couple’ by the press, Abarca and Ms. Pineda strikingly reveal the extent to which crime, corruption, villainy and nepotism have infiltrated Mexico’s institutions. Given their position, acts committed by and under them are of such nature as to be filed under state terrorism. The level of impunity and terror that defined their rule have sent waves through Mexico and alerted the shocked nation of the presence of a local failed state. Investigations have revealed a shocking profile of Abarca’s crimes: rampant nepotism in his administration, money laundering, illicit enrichment, corruption, and ties to organized crime. Abarca is also being investigated for his participation in the kidnap and murder of local activists—the incident that prompted the normalistas’ protest last year. Witness testimonies claim the person who pulled the trigger in that killing was none other than Abarca himself. Maria de los Ángeles’ biography is just as alarming: she was one of the leaders of Guerreros Unidos and has direct family links to known members of Mexico’s most violent drug cartels. More than 70 arrests have been made in connection to the events of September 26. At least 30 of them have been police officers linked to organized crime. Both Abarca and Pineda have been branded the intellectual authors of the disappearance of the 43 normalistas. The couple was detained last week in a working-class neighborhood in Mexico City. Both await prosecution. 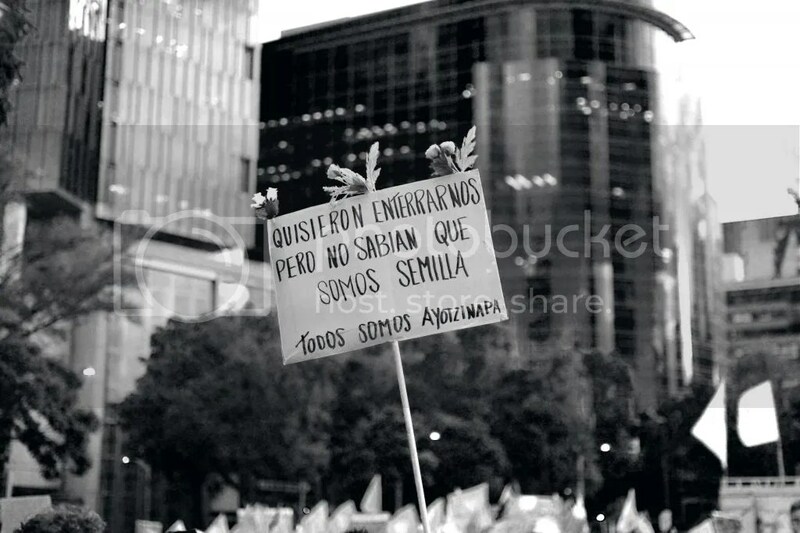 Although the current administration initially tried to downplay the case as an isolated incident, Ayotzinapa reminds Mexico of the unspoken truth of which most of its citizens are aware: crime and corruption are a cancer of Mexican politics and they can be seen and felt everywhere. There is perhaps no location in the country unaffected by violence and no citizen in the nation that can deny the endemic corruption that hamstrings the entire sociopolitical system. Lacking workable institutions to address and implement change, the citizens of Mexico are taking to the streets to vent their frustration with the system and the individuals that simultaneously run and corrupt it. ← WHERE ARE THE SLUMS IN CHINA?